Millbrook Cathedral collaborates with vendors to help you create the perfect day, and these wonderful creative minds love to share and so do we! Check back often for the latest tips and tricks from the pros. 1. What kind of ceremony do you want? Decide on what kind of ceremony you want. Do you want a customized ceremony? You are not a cookie cutter couple and your ceremony shouldn’t be generic. Can you write your own vows? Will they show you some ceremonies that they have created? A ceremony should reflect the couple and not the officiant. Ask if they will incorporate your cultural traditions, ask how they create their ceremonies. If they don’t ask for information such as you love story, interests, quirks, etc. how will they personalize the ceremony without your input? 2. Do you feel a connection with your officiant? This is important because you need to feel comfortable asking questions. An officiant should be warm, and open to your questions, input and concerns. A good officiant understands that this is your wedding and you have to feel comfortable with the person you are working with. You also want that person to have similar views about the ceremony as you do. Do you want something serious and solemn, or are you more a of a fun loving couples that wants some humour throughout? 3. How soon should you book? if the wedding date falls between May to October. The more time you have to meet and screen officiants, the better chance of finding the right officiant for you! 4. How do I know they will do a good job? Read their reviews! In addition to learning about the types of service they perform you also need to look at their photos. 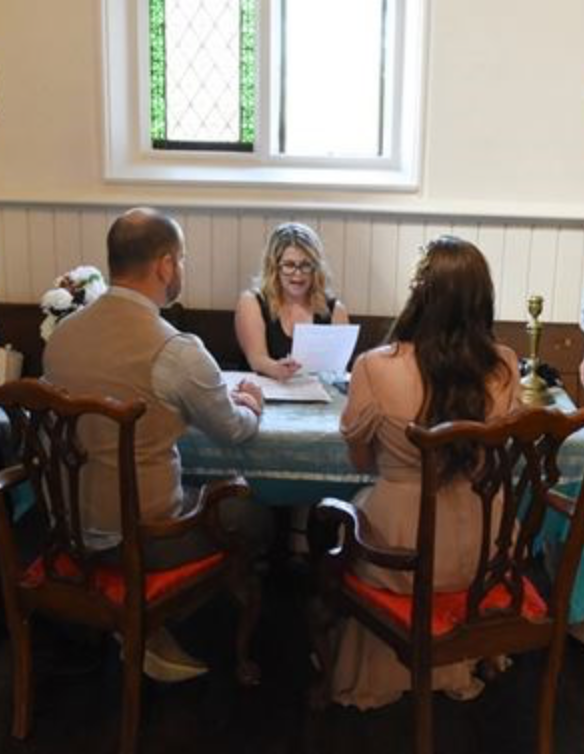 Remember the officiant will be in your photos forever so you also want to know that they come prepared, put together and in colours that you approve. 5. What should I budget? When considering an officiant, ask if their fees are all inclusive to avoid being charged extras such as travel, rehearsal and tax. The cheapest is not always the best. A good officiant will have several calls with you after booking, arrive early and spend hours creating a personalized ceremony. Don’t skimp on this very important part of your wedding day! You can expect a wide range of quotes from $350 - $850 with the average being around $400. Janine Plotkin is a registered officiant with The Province of Ontario. She owns Tie the Knot Marriages. She offers personalized ceremonies and offers all types of ceremonies. Top 5 Tips For Styling Wedding Tablescapes - by Roselle & Co.
1. Remain consistent with your styling. The best place to start when looking to create the perfect tablescape is to choose an style and keep it consistent with the rest of your wedding such as your Floral design, Furniture, Stationary Suite & Decor. For example, if your wedding styling is industrial, elegant, minimal and modern; continue this feel for your table setting too, to create a cohesive visual aesthetic the flows nicely throughout the rest of your Event. Consider using layers by mixing materials and different textures to make the setting more visually appealing. Using layering on your wedding table styling will help give your setting the detail and depth. 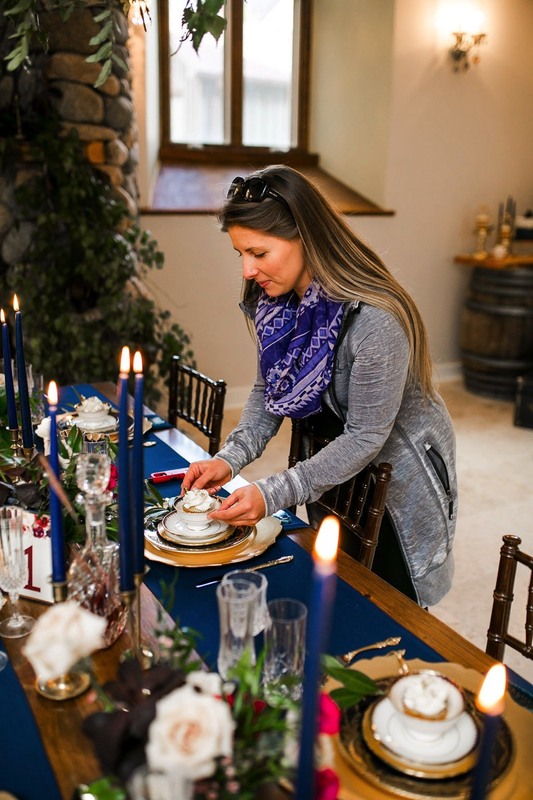 Without layers your table settings would be one-dimensional and flat. You may choose to build on your wedding table with charger plates topped with beautiful Luxury Vintage Fine China Dinner plates, a linen napkin and place card or menu card. Get creative with your layering elements like herbs, shells, fresh fruit, books and foliage depending on your overall wedding style and vision. Think about the practical side of things before you get carried away. - Will the placement of your table decor and centerpiece allow for your guest to chit chat across the table? - Have you checklisted and actually covered all the essential items for food and services? Always order extras just in case. Try using heights or levels to your styling to give your tablescape a more interesting, lush and full feel. For example, if all your table elements & details are the same height, the overall look of your reception space might look and feel bare and simple. In other words don't overcomplicate things. If you're feeling overwhelmed with table styling, consider speaking to your designer or your event planner. Using statement tableware or beautiful vintage dinning tables as your base means you spend a lot less money and time trying to enhance or amplify your tables with other decoration. Keep things simple and have fun while doing it! Pinky Up & Cheers !! By Cami from Roselle & Co.
Roselle & Co specializes in Fine China,Tabletop decor and Vintage Furniture Rentals. We offer high-end vintage bone China and timeless furniture rentals such as sweetheart/dessert/signing or guest tables. From dainty cups & saucers, to teapots, stemware, tableware, vintage trunks, frames, easels, mirrors, photo backdrops and so much more.